Dear Dads, here’s a gift you won’t want to wait for! The Personalised Your Life in Pictures Book. Father’s Day is just around the corner, and for those remarkable rad Dads, let’s give them a gift to remember. Rewind and reminisce with the beautifully bound book that takes you through the memorable days of your life. 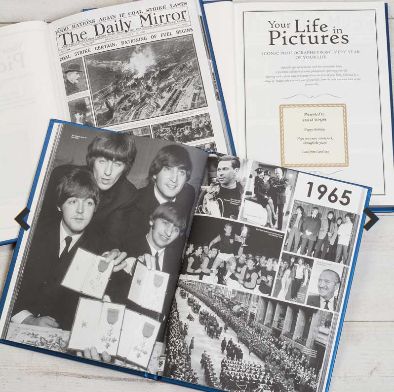 From news stories to world-wide moments, iconic photographs will take you back in time! With a photo for every year, take Dad down memory lane! Fun for all the family this Father’s Day, Dad can finally tell all those stories that begin with ‘Back in my day…’ to all the family. Featuring a front page of a newspaper on their date of birth, this extra special gift is great to mark their life! With a stunning blue silk effect cover, this book can even be personalised with their name and birth date – appearing in gorgeous gold embossing. Write a personal message for the first page, so when the recipient opens it a loving message will await them. This special souvenir is a great keepsake and available for only £29.95 from www.prezzybox.com.